In this randomized controlled study, we are investigating and refining health alerts produced by environmentally-embedded in-home sensor networks designed to detect early signs of health change and functional decline in older adults, the keys to successful intervention. When our sensor network detects these changes the system automatically sends appropriate alerts to the caregivers to allow early intervention. By helping older adults remain healthier, active, and in control of their chronic illnesses with early detection of changes in health status and early intervention by health care providers, millions can remain independent as they age, avoiding or reducing debilitating and costly hospital stays and, for many, avoiding or delaying the move to a nursing home. 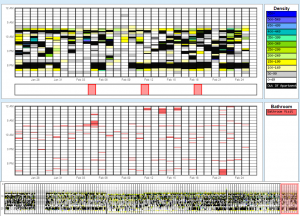 Refined automated early illness detection algorithms developed previously. Conducted a prospective randomized controlled intervention study using an intelligent environmentally-embedded (non-wearable) sensor system to measure the clinical- and cost-effectiveness of using data from these sensors to detect early signs of illness or functional decline in older adults compared to usual health assessment. 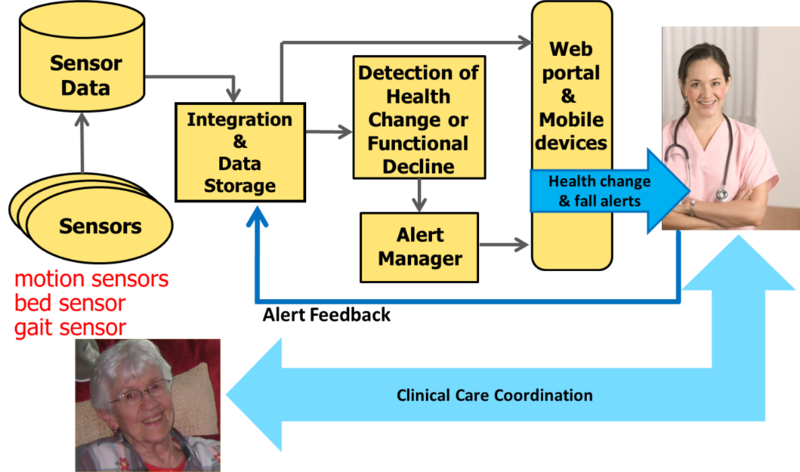 Developed and refined ways of providing sensor information to older adults and informal care givers to help them directly better manage changes in health status. During the data collection phase of this project we have had 241 older adult participants (128 with sensors and health alerts as the intervention, 113 controls receiving normal care only) living in 14 assisted living and senior housing communities throughout mid-Missouri, collecting many terabytes of data describing resting pulse and breathing rates, bed restlessness, in-home gait speed, fall risk, actual falls, and typical daily activity patterns. The system analyzes the collected data using advanced algorithms to detect signs of health change and functional decline and automatically sends alerts to the facility care staff when appropriate to enhance their ability to provide proactive care. As part of this project, we are actively analyzing the data to determine the trends and health outcomes of the participants. We anticipate positive health outcomes of the intervention group over the control group and determine next steps to further improve and refine the sensors, algorithms, and alerts to continue improving the society’s ability to care for the steadily aging population. Figure 1. 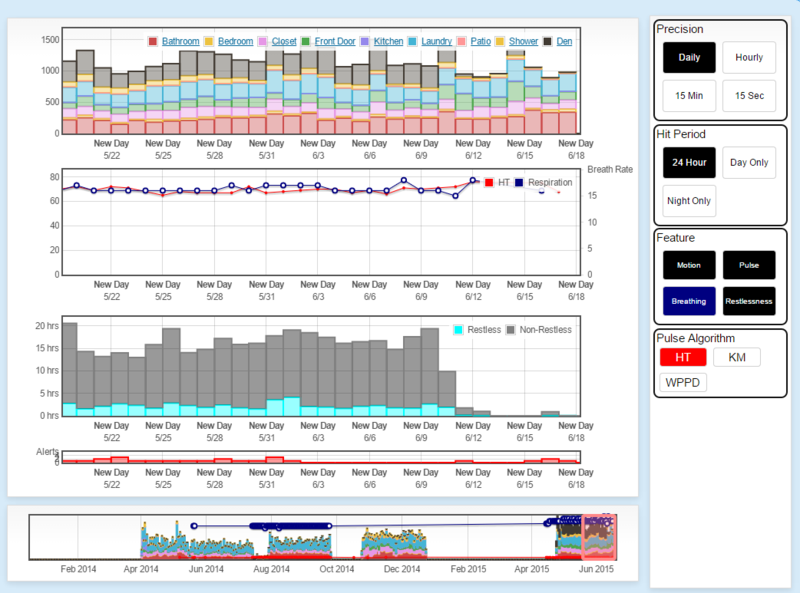 The in-home sensors are used in a clinical decision support system. Falls and early signs of health changes are detected automatically, and alerts are sent to the clinical staff, to facilitate early interventions. Figure 2. 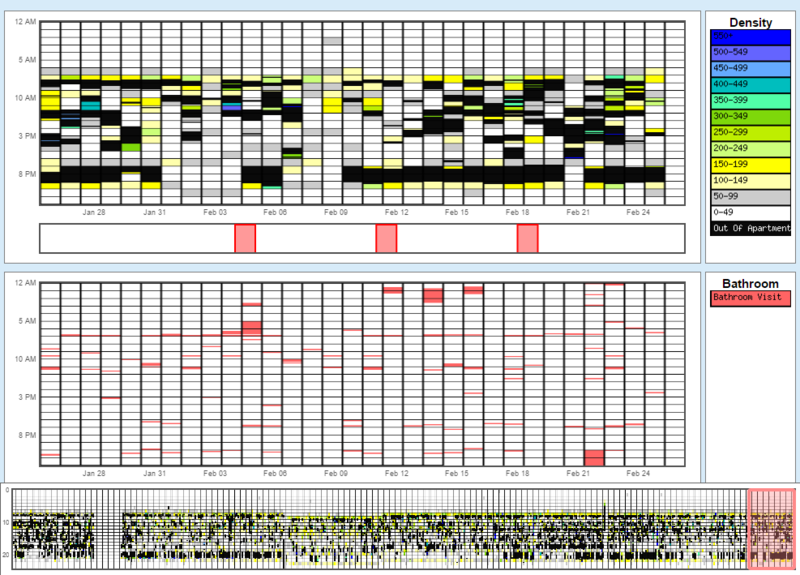 A visualization showing motion and bed sensor data. Figure 3. A visualization showing motion sensor data in the form of motion density and bathroom visits. Figure 4. Gait data collected passively in the home using depth images. Phillips, L. J., Deroche, C., Rantz, M., Alexander, G. L., Skubic, M., Despins, L., Abbott, C., Harris, B. H., Galambos, C., & Koopman, R. Using embedded sensors in independent living to predict gait changes and falls. Western Journal of Nursing Research, in press. Skubic M, Harris BH, Stone E, Ho KC, Su B-Y & Rantz M, “Testing Non-Wearable Fall Detection Methods in the Homes of Older Adults,” Proceedings, IEEE Conference of the Engineering in Medicine and Biology Society, Invited Session, Orlando, FL, August 2016. Rantz M, Lane K, Phillips LJ, Despins LA, Galambos C, Alexander GL, Koopman RJ, Hicks L, Skubic M & Miller SJ, “Enhanced RN Care Coordination with Sensor Technology: Impact on Length of Stay and Cost in Aging in Place Housing,” Nursing Outlook, 2015, 63(650-655). Rantz M, Skubic M, Abbott C, Galambos C, Popescu M, Keller J, Stone E, Back J, Miller SJ & Petroski GF, “Automated In-Home Fall Risk Assessment and Detection Sensor System for Elders,” The Gerontologist, 55(S1):S78-S87. Rantz M, Skubic M, Popescu M, Galambos C, Koopman RJ, Alexander GL, Phillips LJ, Musterman K, Back J, & Miller SJ, “A New Paradigm of Technology Enabled “Vital Signs” for Early Detection of Health Change for Older Adults,” Gerontology, 2015, 61(3):281-290. * PMCID: PMC25428525. Skubic M, Rantz M, Miller S & Musterman K, “Capturing Behavioral Biomarkers to Guide Personalized Treatment,” Proceedings, NIH-IEEE Strategic Conference on Healthcare Innovations and Point of Care Technologies for Precision Medicine, Bethesda, MD, November 2015. Sheahen M & Skubic M, “Design and Usability of Smart Home Sensor Data User Interface for Clinical and Research Audience,” Proceedings, International Conference on Smart Homes and Health Telematics, Denver CO, June 2014, pp 13-20. Skubic M, Jimison H, Keller J, Popescu M, Rantz M, Kaye J & Pavel M, “A Framework for Harmonizing Sensor Data to Support Embedded Health Assessment,” Proceedings, IEEE International Conference of the Engineering in Medicine and Biology Society, Chicago, IL, August 26-30, 2014, pp 1747-1751.